Cohen’s lawyer already gave one tape to CNN, where it sounds like Trump is ordering Cohen to “pay with cash” when the topic of a hush payment to former mistress Karen McDougal arose. Given that Trump only processes reality through a media lens, we can assume that this leak was a deliberate message sent to Trump. It’s one thing to go on TV and talk about how you could hurt Trump, but it’s another thing to send evidence to a TV station that does indeed hurt Trump. That sets the tone for what is to come, and if Lanny Davis’ bluster is any indication, there is plenty more on its way. We have a criminal president. Trump Taj Mahal was slapped with what was at the time, the largest fine a casino has ever received for anti-money laundering violations. His business ventures are littered with relationships with shady characters, and he even said as much when he told Chris Matthews that “I’ve known some tough cookies over the years. I’ve known the people that make the politicians you and I deal with every day look like little babies.” Now, the man overseeing a significant portion of Trump’s shadiness is speaking out. This is not a war that Trump has the ability to win. His only hope is to muddy the waters enough where the damaging releases by Cohen are obscured by whataboutism. 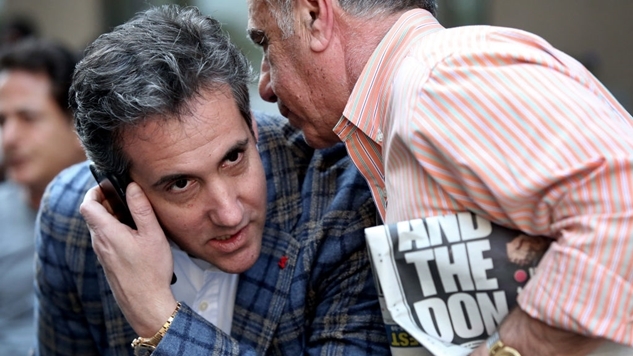 By all accounts, Michael Cohen feels like a jilted lover. He pitched himself as a Ray Donovan-esque fixer who operated in the shadows on behalf of a man he expressed unabashed loyalty towards. However, as soon as Cohen found himself in need of both legal and financial help, he quickly learned that loyalty does not go both ways in Trumplandia. Everything exists to serve Trump’s ego, and Cohen cannot help Trump, he can only hurt him. Unfortunately for POTUShitforbrains, he would rather keep his reputation as the cheapest rich man in existence than part with some cash to rid himself of a serious problem. Now that problem is fighting back, and it has plenty of audio ammo to keep this story in the news for a long time. This is just getting started, folks.